And the story of Hanover (Germany)-based Epic Melodic Metal band HUMAN FORTRESS obviously was not completed. Defying the odds now, after a five-year hiatus and a heavily-discussed previous album (“Eteral Empire“) on which the band abandoned from their path, HUMAN FORTRESS are back with a fantastic new offering. What we have here now is the reunion of the band’s former members Todd Wolf (guitars), Volker Trost (guitars) and Apostolos “Laki” Zaios (drums), added by new members Dirk Liehm (keyboards), André Hort (bass) and last but not least – the new vocalist of HUMAN FORTRESS, Brazilian Gus Monsanto (ex-Revolution Renaissance/Adagio). And the kind of quality that HUMAN FORTRESS deliver with their fourth album “Raided Land” is indeed more than impressive and exceeds all expectations. The band has managed to create an Epic Melodic Metal album full of big hooklines and their characteristic melodies. There is a folky/Medieval touch to the material at times, also the guitars are a little heavier (in a classic way) and on top of this, Gus Monsanto is towering with his powerfull and expressive voice that makes the stories of old battles come alive before your inner eye. It’s the combination of melody, heaviness and their quite unique songwriting (still somewhere between Kamelot, Virgin Steele and Iron Maiden) that makes HUMAN FORTRESS stand out. “Raided Land” was mixed and mastered by Seeb Levermann (Orden Ogan), cover artwork and booklet layouts are by Croatian artist Kristijan Kulis. The beginnings of HUMAN FORTRESS reach back to 1997, when the Hard Rock band “Timezone” was founded in the Hanover area, which later should change their style towards Melodic Metal and rename to HUMAN FORTRESS. After a first demo, which was very well received in the underground, several contract offers came up so the band signed with Limb Music. The debut album “Lord Of Earth And Heavens Heir” was released to critical acclaim in 2001, followed by “Defenders Of The Crown” two years later. With several line-up changes (most significantly ex-Galloglass vocalist Carsten Frank replacing Jioti Parcharidis), the band’s third album “Eternal Empire” was released in 2008. Despite the album’s qualities, the down-tuned guitars, more modern overall approach of the material and the shouting of Frank were a departure from the epic melodic sound that HUMAN FORTRESS were known for. Shortly after the release of “Eternal Empire”, the band split. But at the end of 2008, original members Wolf, Trost, Parcharidis and Zaios started planning to resurrect HUMAN FORTRESS. In 2009 Jioti Parcharidis left the band again for medical reasons. 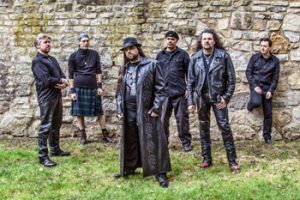 It took a while to get together a stable line-up again, which was found by the addition of Dirk Liehm (keyboards), André Hort (bass) and Brazilian master vocalist Gus Monsanto (ex-Timo Tolkki’s Revolution Renaissance, Adagio). First plans: a re-release of the band’s debut album “Lord Of Earth And Heavens Heir” (incl. 4 bonus tracks) on October 25th and of course the release of the brand new HUMAN FORTRESS masterpiece “Raided Land” on November 29th.